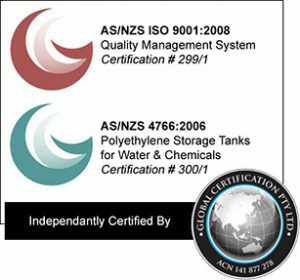 Clark Tanks is one of very few Australian tank manufacturers that are certified to both the Australian Tank Standard AS/NZS 4766:2006 and ISO 9001:2008. This provides you with an additional guarantee that you are dealing with a manufacturer with an absolute commitment to quality. As an ISO 9001 certified manufacturer, Clark Tanks are independently audited to ensure their manufacturing processes and material suppliers all comply with the standards required which ensures a very transparent and traceable quality process. We have always led the way in quality tanks and are one of the few tank manufacturers to test every tank. The wall thickness of each tank is measured in many crucial locations. An impact test is performed on a cut-out section of each tank. to ensure the polymer chains are not brittle and have bonded together correctly. A visual inspection is also performed to ensure there are no abnormalities. Buying a certified Clark Tanks tank ensures that you will receive a high quality, well tested product that will last its warranty period of 25 years. Is Your Tank Really AS 4766 Certified? serial numbers must be marked on every tank. Ultrasonic Thickness Testing – ultrasonic equipment measures the thickness of a water tank. Impact Testing – tests the strength of the plastic used. Visual Inspection – experienced staff closely inspect the interior and exterior of the water tank. An ultrasonic measuring device is used to determine the thickness of our tanks to within 0.1mm accuracy. At Clark Tanks we use this device on 10 sections of the tank including areas of the lid, wall and base. The Australian Standard requires that no section be thinner than 4.5mm. All Clark Tanks’ water tanks exceed this standard. We additionally test areas around the tank of a similar height. This verifies our tanks are a consistent width all the way around which ensures long-term durability. This measures the impact strength of the plastic used which ensures that the tank has been made correctly and is not brittle. When the inlet strainer is cut from the tank, two samples are removed to be used for impact testing. The samples are allowed to cool slowly at room temperature for 24 hours, then cooled to -40° Celsius for 6 hours to stress the polymer chains to their limits. A 9kg dart is then dropped onto each sample to test the material strength. If a sample cracks or is pierced then the tank fails the test and will not be sold. The interior and exterior of the tank is visually inspected by experienced staff who look for defects. It takes the trained, experienced eye of our skilled staff to spot these possible defects before any tank reaches the public.